Despite the so-called makgeolli boom of a few years ago, the humble and at times toothsome drink has never been the goal of truly traditional Korean brewers. This lecture will explore traditional Korean recipes and techniques, shedding light on the great variety and complexity that characterizes Korea’s brewing heritage. It will also delve into the effects of Japanese and American occupation and influence, as well as contemporary attempts at revival and reconstruction of past knowledge and practices. And, of course, no lecture on brewing would be complete without a tasting. The presenter will bring a variety of his own brews, all made at home and with simple equipment, in order to bring substance to the more theoretical portions of the lecture. *This lecture includes Dr. Frankl’s homemade makgeolli tasting after the class. ​John M. Frankl is a professor of Korean and Comparative literature at Yonsei University’s Underwood International College. He received his Ph.D. from the Department of East Asian Languages and Civilizations at Harvard University in 2003. 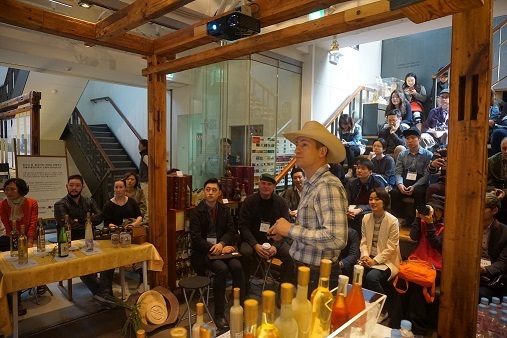 He has spent 19 of the past 29 years in Korea as both student and professor, and began studying and brewing traditional Korean alcohol 5 years ago. He is a graduate of the Korean Home Brewing Research Institute’s (한국가양주연구소) courses on both brewing and the making of nuruk. His brews won bronze and gold medals, respectively, in the 2014 and 2015 Royal Court Brewing Contest (궁중술빚기대회), as well as the Special Judge’s Award in the 2015 National Home Brewing Championships (전국가양주주인선발대회). He was the only non-Korean in all three events, and has now retired from competition to focus on brewing and writing about traditional Korean alcohol.